In his opening remarks the president of the union Alhaji Mohamed Sallieu Bangura welcomed the executives and stressed their roles and responsibilities in keeping their members nationwide with the vision of the Union and the strides made in promoting their welfare. He also stressed that the members should understand and analyse the content of the Free and Quality Education so as to actualize the flagship programme of President Bio, which is a way of alleviating the educational financial burden on parents and ensuring that every child acquires education in the country. The SLTU president Alhaji Bangura also noted the high expectations of the teachers especially when they are taking ownership of the project although it is the initiative of President Bio. He admonished all teachers to embrace this laudable free education package that will develop and transform the mindset of millions of our children. Mr Morris Conteh noted that the workshop is to upgrade the capacity of the Union members at various levels so that they can be in a position to address the challenges in the classrooms. Their performance will showcase that the union is relevant, responsive and an effective teachers’ union organisation. The Secretary General of the Union Mr Davidson Kuyateh pointed out that the workshop will also assist the teachers to be in a position to interpreter and educate others about the various components of the Free Education and its implications. Madam Salamatu S Koroma from the Project Office of the Union gave a brief background and the various challenges the union has gone through. She called on the executive to be role models and help disseminate the activities of the union. 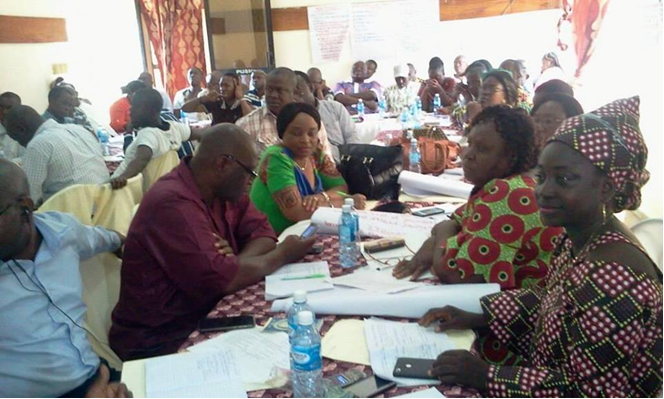 Madam Lucy Darimbui Regional Coordinator Education International Africa noted that they are working with Education Workers Trade Unions to establish democratic organisations of teachers so as to fast track teachers’ welfare, professional development and quality education. Education International Africa also strives for equality and equity of purpose, gender and speaks against marginalization in our communities. They also look at issues related to conducive learning environment, teaching and learning materials, the teachers, facilities in the schools and government policies. She revealed that the workshop will enable the teachers to build on their leadership skills and cascade it into their respective regions. She admonished the teachers that at the end of each stage in the free education program the organisation will want to see various transformation in their schools and communities as this is a target setting workshop to mitigate emerging issues. During the three days leadership workshop for SLTU executive the various topics were covered: the history of SLTU, SLTU structures and functions, Organising and Meetings, Effective leadership and Communication, the Implications of the New Education System, the Rights and Responsibilities of the teachers code of conduct, Labour laws of Sierra Leone, Negotiations, The Teaching Service Commissioned .SLTU strategic plan and evaluation report, Gender issues, Emerging issues and a host of the others. Various recommendations were made for onward submission to the authorities.